The Gift of the Inn (2017) by Golden Keyes Parsons is a fantastic stand-alone novel. This story is available in all forms including eBook, and is 355 pages in length. With a full-time job and a very busy five-year old, this book took me four days to read. I received a review copy of this novel in eBook form from White Fire Publishing. In no way has this influenced my review. The opinions expressed in this review are my own. I give this book 5 STARS. This story is a Christian Historical Christmas novel set in 1944 Colorado, Texas, and Germany/France during WWII. The Gift of the Inn is one of the most engaging, endearing, and emotional novels I have read in a really long time. This story gripped my heart from page one, and ran me through an emotional roller coaster. Several times, I had to stop my reading and grab my child up and hug her hard, or praise God for my husband’s well being. This book definitely reminded me to be grateful for the protections God has placed upon me and my family. It’s Christmas Eve, 1944, in Colorado Springs, Colorado. Naomi, the main character, has struggled with this day ever since her 9 month old daughter, Julia, was kidnapped 17 years prior. Gracie, 18 years old, 9 months pregnant, and estranged from her parents, is struggling on this day because her husband, Jack, is overseas in Germany fighting Nazis and Hitler, and she hasn’t received a letter from him in a couple of months. Trapped by an intense winter storm, Naomi and Gracie unknowingly (and then, knowingly) help each other through an emotionally rough day. And, let me tell you, this “day” ran my emotions up, down, and sideways. I cried, I cheered, I was angry. Truth be told, I’m still angry at one character 12 hours after having finished the novel — that’s how much this book has affected me. The absolute best part of this story for me is the excellent Godly message. Naomi has had one of the worst things happen to her as a mother — the loss of her child. She spent years praying to God for guidance, help, answers, resolutions, and peace. But all she has ever met with is silence. So, Naomi stops praying. She never stops thinking about her child, but she just stops praying. And, the meaning behind Christmas dies in her heart. But, on this Christmas Eve day, Naomi really looks at her Nativity scene, and realizes that she has missed the most important aspect of Christmas — Jesus. Christmas is not about getting what I want, it’s about recognizing the intense love God has for me. God sent His perfect Child down to earth in the form of a helpless babe. God did this so that Jesus would grow up and die a sacrificial death so I can have a closer relationship with Him. On Christmas, when we look at our Nativity scenes, it should smack us right between the eyes that the vulnerable baby laying in that manger came to earth to die for us. The best part of this message is that even if we, like Naomi, give up for a season or two or three, God still wants us. He will always wait for us. That’s real grace, and that is the true meaning of Christmas — REDEMPTION! What a lovely, wonderful, truly-needed message. The Gift of the Inn is so good. SO GOOD!!! And, clearly, there is so much to talk about with this book. If you are looking for a novel that grips you from page one, has really well-written characters, an intense plot line, and a fantastic moral theme, then look no further. 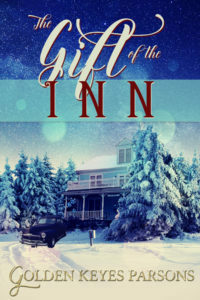 The Gift of the Inn is the book for you! I expect nothing less from any story written by Golden Keyes Parson. She is very much missed! I was devastated to read about her death. So sad. This was my first read of Parsons’s work. Now I will have to go devour all her other works. Golden will always stand out to me as one of those people you meet that are so full of love and joy and grace and class that it sort of spreads out around them like a balm. What a wonderful woman! My best friend is like that. People gravitate to her kindness and warmth and sense of humor. Aww. I love it when a story can really pull at your heart like that. It’s a great novel. Super fast read, too!